The Second Month | For the Joy of Life. 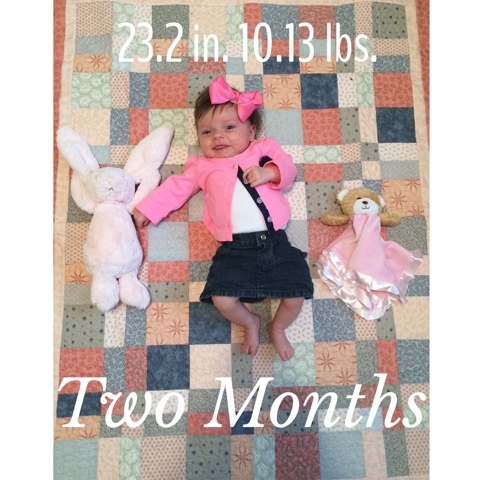 Happy Two Month Birthday Oaklyn Joy! Ha no wait, she literally just woke up after I finished typing that. This month has been so much better than the first month on my end. I'm so grateful for tomorrow's, because I sure needed quite a few that first month. Oaklyn looks at me and I know that she knows me, she stares into my eyes and gives me the biggest smile, it makes me feel like the happiest mother in the world. Some nights are longer than others, some days are harder than others, but I know that it's absolutely worth it and I finally understand why everyone kept telling me that. She seems to grow more and more every single day. Shes starting to grow out of some of her newborn clothes and it breaks my heart every time I have to put another pair of pants or a onesie away, she'll never fit in them again. that's what I keep having to remember, that she'll never be this little ever again. She eats a full 4 ounces every single feeding. Oh yeah and I'm still pumping and I still hate it, but I'm also grateful she's getting the nutrition she needs. For the first few weeks of her life I wasn't able to set her down for more than five minutes without her screaming. Now as long as she's fed and all of her needs are met she will stay put for 15 to 20 minutes at a time. it's been much needed for this mama. She still super gassy but we find it hilarious and she's a champ at blowing out her diapers. All of that luscious hair she has is still going strong and staying put! She LOVES to be snuggled in her blankie with her pacifiers for naps. She sleeps like a champ at night as long as she's swaddled and ticked away in her sleep sack. She is so fun and is the source of most of our smiles and laughs every day. Sometimes, while she's sleeping, we'll lay in bed together just looking at pictures of her and laughing at all her funny faces. I'm loving watching her grow, but I'm also wishing time would slow down. Our tiny baby just keeps getting bigger and even though I'm loving watching her hit each milestone, I can't help but wish life had a pause button.